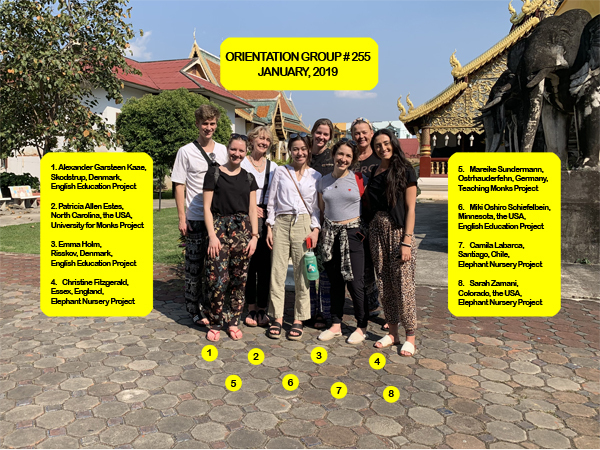 Presenting Chiang Mai Volunteer Group #255! This is a great group of eight new volunteers from Denmark, Chile, Germany, the United Kingdom, and the United States. Three of the volunteers are participating in our Elephant Nursery Program, and the other five are participating in our different Teaching Volunteer Projects. They completed orientation over the weekend and started in their projects Monday. "Getting to be a part of these students’ academic and social development, and playing a role in their joyful lives, has been an extraordinary experience that I will never forget. Each day brought new excitements, and even the smallest moments have brightened and changed my life, and I can only hope that it has changed theirs too. I appreciate Friends For Asia for giving me this opportunity, and am thankful for the welcome I received upon my arrival and throughout my stay in Bangkok."